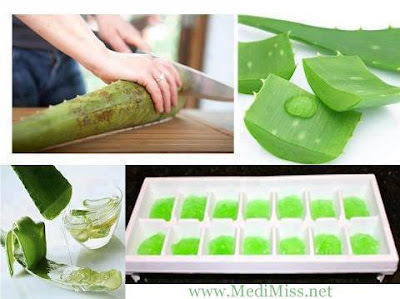 MediMiss Beauty Beauty Hints Natural Remedies Skin Care HOW to FREEZE Aloe Vera GEL! ts from the aloe vera plant. No one plant offers all the health benefits of the aloe vera plant. When ready to harvest the gel from an aloe leaf, choose an outer leaf that is healthy and grows toward the bottom of the plant. To remove the leaf, cut it at an angle close to the plant's base. Plants that are too immature to harvest will not have leaves growing close to the ground. Once you cut the leaf from the plant, place it upright in a container in a slightly tilted position. Let the leaf stay in that position for approximately 10 to 12 minutes, allowing the sap to drain from the leaf. Place the aloe leaf on a flat surface such as a cutting board. Carefully cut off the tip of the leaf and the pointed rough edges on both sides using a very sharp knife. Make certain to cut both sides of the leaf all the way from top to bottom. Scoop out both the slimy mucilage gel and the clear inner gel which appears more as a solid gel. For most leaves, a spoon works for scooping out the gel. If the leaf is very large, a butter knife may work best. When removing the gel, it is important to press down lightly but firmly, being careful not to remove any remaining sap. Store the aloe gel in the refrigerator in a plastic container that is safe for food storage or a glass container. The best container choice is a dark green or brown glass jar, which helps to keep out light. Many people add a drop of vitamin E and a small amount of citric acid powder to prevent discoloration and make the aloe vera gel last longer. In place of citric acid powder, simply crush a vitamin C tablet into powder or use a drop of grapefruit seed extract. I am still not sure about the freezing process but thank you so much for explaining how to harvest the plant and it's many uses. It really does work well for burns. Thank you so much for explaining so much.